These new updates are about thefts of three antiquities from protected monuments in Gujarat and Rajasthan and their confirmed illegal export that happened some years ago. 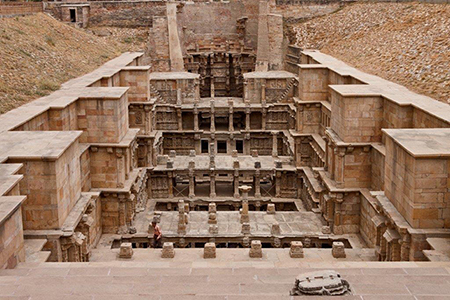 The Ranki Vav stepwell, or the Queen's Stepwell, was excavated by Queen Udayamati in memory of her husband the Solanki King Bhimadeva I in the second half of the eleventh century. This monument, adorned with hundreds of sculptures, is a centrally protected monument of the Archaeological Survey of India, declared in 2014 a World Heritage monument. In the year 2001, vandals stole two sculptures from the premises during the same night, a Brahma with his consort, and a Ganesa. Please see Alerts “Brahma-Brahmani Theft” and “Ganesa Theft” on this site. K. Mankodi, The Queen’s Stepwell at Patan (1991), Fig. 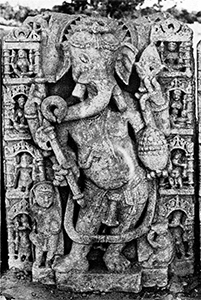 205, published the Ganesa sculpture. Its present location is not known. The temple of Siva known as Ghatesvara, and seven others at Baroli in Rajasthan, datable to the first half of the tenth century A.D., are under the protection of ASI. The name Ghatesvara, “Siva whose Linga is of a globular pitcher shape”, probably has something to do with the fact that the bed of the Chambal river nearby is strewed with large rolled boulders. Two thefts occurred at Baroli some years ago. It is known that both sculptures were illegally exported; their present locations are well known, but it has not been possible to repatriate them. 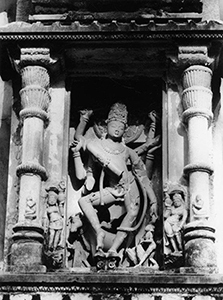 The first piece is a dancing Siva or Natesa about four feet tall that was in the rear or western niche of the shrine. The eight-armed god carries his usual attributes such as a cobra and a skull cup in his surviving hands. It was stolen from its niche in 1998. The sculpture was eventually traced to a private collector abroad who was persuaded to relinquish the illegally exported antique. The vandal who committed the theft and smuggling, obviously part of an international network, later left a matching fake at the site, to hoodwink the authorities into thinking that the original piece was being returned. See the photographs of Ghatesvara and its Singarachauri, then the original Natesa in his niche taken before the theft, and the fake Natesa in the Rawatbhata police station. The Natesa from Baroli's monument of national importance remains to be reclaimed by the authorities, as per available information. Papers relating to this case obtained from Rajasthan police were sent to ASI New Delhi in 2010. The second example from Baroli is a Nayika or celestial female. 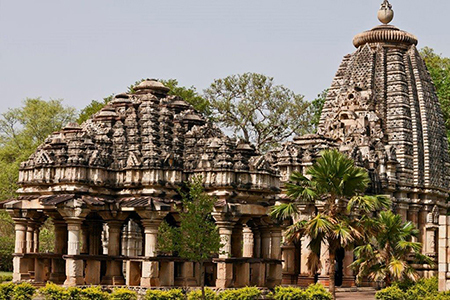 In front of the Ghatesvara temple is a detached mandapa called the Singarachauri, an ornate hall. The four columns in the centre of this structure were meant to be crowned by figures of celestial females. 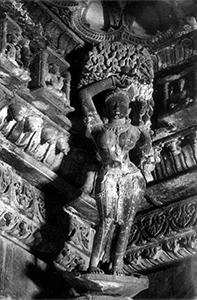 Until 1960, the Nayika on the north-western corner pillar inside the mandapa was still in place, as can be seen in the accompanying photograph from the ASI's record, photograph No. 1960/3. When Dr. L. K. Tripathi was writing his book called The Temples of Baroli published in the 1970s, the sculpture was no longer at the place. The Nayika eventually turned up in the Denver Art Museum in the USA. It is described and illustrated in Gods, Guardians, and Lovers, edited by Vishakha N. Desai and Darielle Mason, at pp. 214-215 and Pl. 45, where it is clearly attributed to the Singarachauri and as being on display in the Museum. Its register number is 1982.198. ASI was informed repeatedly since 2005, each time enclosing the relevant pages from Gods, Guardians, and Lovers and the ASI’s own in situ photograph. 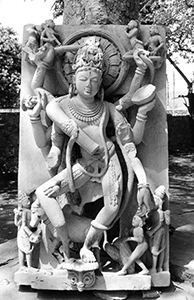 This reply from the Denver Art Museum was also forwarded to the ASI with the request to explore the possibility of reclaiming the sculpture, since the Singarachauri is a protected site of the ASI. 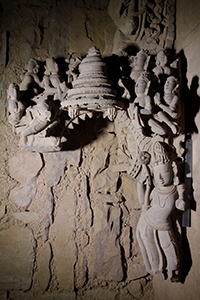 It is not known if any action has been taken about either the Natesa or the Nayika sculpture, both of which were stolen and illegally exported from a site that the ASI is supposed to preserve and protect. In August 2006 thefts of sculptures took place from the centrally protected site of Kari Talai in the Katni district of Madhya Pradesh. One of them was notified by Interpol and was recovered by the US Homeland Security Investigations (HSI). This was the torso of a Vishnu image. The others were posted on www.plunderedpast.in as Kari Talai alerts 1 to 4. Recently, special agents of HSI raided an antique dealer in New York and recovered several sculptures. This raid was shown in a video by CBS TV. 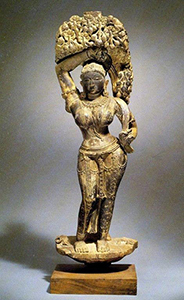 One of the sculptures is a match for Kari Talai 4 alert, an apsara or celestial female figure. HSI has confirmed the match. See Accession no. KTI 264 in the alert photo. This shows that it is possible to trace sculptures stolen, and in the above case smuggled out of the country. Therefore, please keep reviewing www.plunderedpast.in from time to time. Atru's Amorous Couples Back Home After Four Years! 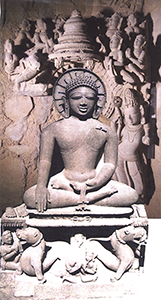 As reported worldwide from 15 January 2014, two sculptures illegally exported from India in 2009 were handed over to the Indian authorities by the US government. 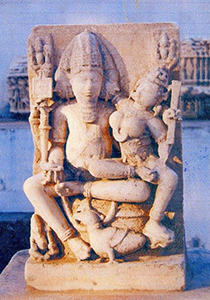 The sculptures are of two amorous couples, known in Indian art as Mithunas, and they were stolen from the Gadgach ruin at Atru in southern Rajasthan. This was the closure of a process that started four years ago, immediately after the thefts. The first theft occurred on 22/23 April 2009, followed by the second barely five months later, on 18/19 September. Within six months of this second theft the sculpture was advertised in the art journal ARTS OF ASIA, Hong Kong, in its March 2010 issue, at page 61. Early April 2010 the host of this website alerted the Archaeological Survey of India and requested it to write to the Indian High Commission in London where the sculpture was at that time and the international security agencies, and to trace the other stolen amorous couple as well. At the same time he also circulated E-mail messages to scholars, institutions and other agencies worldwide, with photographs of the protected monument and both the stolen panels in situ. Following prompt action by the Indian missions and the US Homeland Securities, and the concern shown by the scholars who had received the E-mails, both couples were recovered. The host of this website was requested to authenticate a photograph of the un-advertised sculpture by the Consulate General of India, New York. There is much confusion about the identification of the figures. Newspaper reports have described them as the god Vishnu and Lakshmi and Vishnu and Parvati respectively, or as Krishna and Kubja. That they are not Vishnu and his wife Lakshmi is clear since they have no attributes of these divinities. Vishnu and Parvati is the height of promiscuity since Parvati is the consort of Shiva, not Vishnu. Krishna and Kubja refers to the cycle of adventures from the childhood of the Hindu hero Krishna (Krishnalila), from the exchange of the infants to save Krishna from his cruel uncle Kamsa, king of Mathura, up to Krishna's sojourn to the court of Kamsa and the death of the cruel king at his hand. On the way to Mathura Krishna meets a hunchback old woman ("Kubja") whom he restores to perfect health. When the Indian mission in the US requested this host to authenticate the photograph, it was already described as Krishna and Kubja. The misnomer no doubt happened when the the dealer showed the sculpture to some experts for its valuation, whose imagination ran riot when they saw the dwarf figure, which is in fact a standard motif in Indian art, and has nothing to do with Krishnalila. All the same and notwithstanding the confusion of the ignorant, it is a matter of great satisfaction that the two Mithunas from Atru have been handed over by the US. The Stolen Buddha from Bilhari "Virtually" Restored on www.plunderedpast.in! A Buddha sculpture stolen from Bilhari in Madhya Pradesh and probably illegally exported was the subject of an alert first circulated by E-mail on 29 November 2012 and later posted on this website. This Buddha was crowned by a parasol and eight celestial adorers and was flanked by two attendants. The whole composition had already broken into three, the vandals carrying away the Buddha but leaving behind the rest. One part of this surrounding frame, with an adorer with a lotus flower in the hand on one side and the crowning part above, is still in the Archaeological Survey of India’s store at Bilhari. The Buddha himself stolen on 21 January 2007 remains untraced; the second attendant is not with the ASI, but his feet can be seen in the photograph in the original alert. Bilhari's Buddha thus was violated twice over, once when he was damaged at some unknown date, then again when he was carried away. The sculpture was perhaps never published before. Here www.plunderedpast.in has attempted to reconstruct the original image. 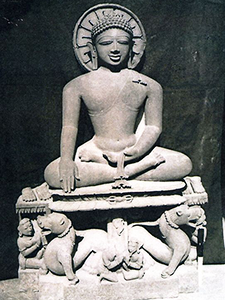 The surviving piece was photographed in the sculpture store at Bilhari by courtesy of the ASI’s Bhopal Circle.